This Peddinghaus cross pein hammer has a unique Ultratec Handle. 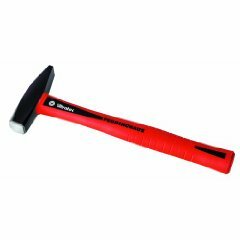 The handle is bonded to the hammer head and features an anti-vibration design minimizing fatigue to the arm. It is ergonomically designed and coated with elastomer rubber for optimal grip. The under section is made of polypropylene with a fiberglass core, therefore unbreakable. Available in six sizes.